It’s that time again! I reunited with the Pantene team and my fellow Pantene Stylistas a few weeks back for another awesome project. This time it’s for Pantene’s latest line, the Nature Care series. Pantene Nature Care has 2 variants: Smoothness and Life for sleek straight hair that sways effortlessly and the other variant, Fullness and Life for hair that bounces. “Bounce!” “Sway!” Ring any bells? I’m sure there’s no need to introduce these girls. They’re my fellow Pantene Stylistas who I fondly call my blogger besties. Laureen and Patricia chose to use Pantene Smoothness and Life while Kryz and I used Fullness and Life. What made this project really special is that it wasn’t just the four of us. This time around, Pantene gave us the chance to choose fellow bloggers to join us in our bounce and sway transformations. We got to choose one blogger each and helped out with their mini makeovers. I chose Bestie Konisis of The Capricious Club to be my partner blogger. 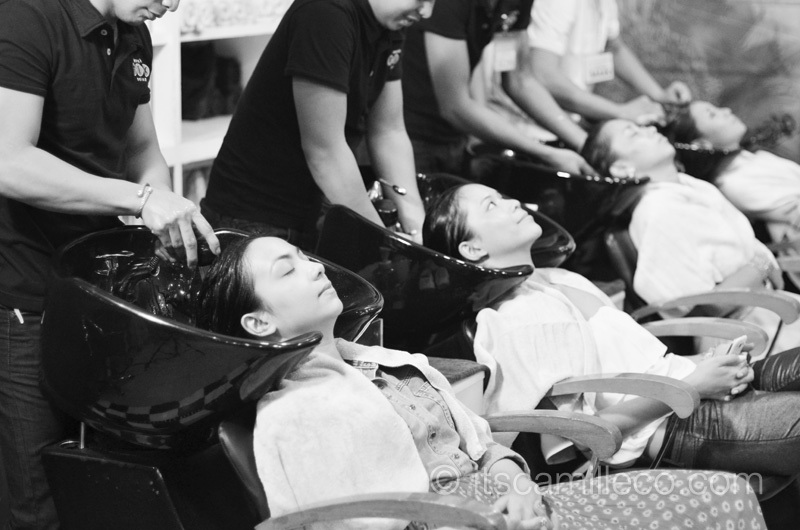 Of course, all four of us Pantene Stylistas also had our hair pampered, as you can see in this photo. Ang lakas maka-product shot ng photo na ito haha! But seriously speaking now, I really love this new line. It smells really good and feels so light as well. It must be because of the new and improved ingredients. They’re much healthier! It’s nice that Pantene is always finding ways to improve their formula. So anyway, back to Bestie, my partner blogger. Bestie was assigned to do “bounce”. She has a really cute and charming appeal so doing “bounce” definitely suited her. Here she is having her hair done after washing with Pantene. Here’s Bestie’s hair transformation! Isn’t she the cutest???!!!?? And here she is again with the man responsible for our awesome hair styles, Pantene hair expert and celebrity stylist Alex Carbonell. This is what I call–labanan ng bangs. Or in English, “the battle of the bangs/fringe”. I could not have found a better partner! I love how our hair fall the same way. I mean not just our fringe but even our curls! The volume is just right. These are type of curls that I love–so effortless and natural-looking. I think I look all too giddy here. Clearly, I love this product too much!!! It does wonders for my hair! And for Bestie’s too! Thank you for doing this with me, Bestie! :) I hope you liked your transformation! Anyway, now that we’ve got our hair in check, time to switch focus to my outfit. As usual, I wore Pantene colors. We were asked to come in white with accents of gold and green. Check! I wanted to wear something simple and sophisticated–something that represents Pantene well. I wanted to convey a clean and crisp look that is both striking and can stand the test of time. The answer? A minimalist silhouette with unique cuts. Come to think of it, I find myself getting more and more attracted to pieces like this asymmetric skirt from Romwe. As I get older, I am starting to invest more in pieces that are simple but one-of-a-kind. This one is especially interesting. The way the fabric was manipulated is so straightforward but it does the job well. I mean look at it! This skirt can easily make any outfit eye-catching. I paired it with the simplest top and it still managed to look striking. See what I mean? Bold cuts + simple silhouettes = two thumbs up! I love your skirt and shoes! Yours and Bestie’s hair look healthy! Hope you could guest more sa mga shows or have a video blog para mas interactive..
Grabe, NGA NGA ako sa shoes! Ganda! Diba? Pantene walks the talk! :) Thanks Jaztine! You are so beautiful. I thought you’re wearing a dress. Ay masama yan. Magconfess ka na, dali! At last!!! nag number 1 ka na sa topblogs, camille! I think ung kris tv ung biggest break mo as a blogger. U really deserve the no.1 spot! congrats! omg i love your style! your dress is so chic, yet edgy too :3 heehee and you kind of look like jessica jung from SNSD. full bangs!!! People keep saying that! Although I find her prettier by a mile! Thanks Inna! and the hair?! isang malaking check ng pink na ballpen! i super duper love this look! Thanks again Honey! Alagang Pantene! Talagang pink?! Haha! Thanks Honey! i blogged about you and Coexist. :) so i can share your “awesomeness” ..
Awww thanks Bianca! I checked it out! :) Thank you! Hi Ms. Cams…wow team “bounce” ka naman naun. I love your hair so much. Buti na lang naka-Pantene na ako. I hope nah makita nah po kita. Kelan po ba ang next na Blogger’s United? I want to see you with Ms. Kryz and Ms. Pat. God Bless to you! December 15-16! :) 2 days! :) See you there! Team Pantene! Yehey!! !Where po?I hope its within Metro Manila. Yehey….Blogger’s United here I come! Oh but I don’t make bags :( Happy birthday! Haha :) I might be too busy though!!! Oh. Its alright. Last try. Can i have a fan sign? Just a simple “happy birthday jade frogoso” would do. How’s that? Do you know Jessica Jung from Girls Generation?? you kind of look like her here! cause you’ve got full bangs! :) unnie, ipuda!! Thanks Inna! People say that a lot. Thank you! Perfect creation! I love your hair! I thought this was a dress! You’re such a pro Ms. Camille, always makes everything look like they’re made for each other! I absolutely love your outfit! It’s so classy and elegant. :) I’m just curious. Who takes your photos for your blog? at I rarely seeing you grinned. ayy. Bihira lang pala talaga kitang makita smiling at expose ang teeth :D hahaha. Ang cutee!! Haha laban kung laban. Not it’s not for a commercial :) Thanks Emmrose! Wow, I love everything!!! Well put together, indeed! And, oh, btw, you and Bestie are soooooooo cute!!!!! <3 Perfect match! Hahaha! Thank you Gem!!! :) We are so matchy-matchy! Woohoo! Thank you Bestie!!!! :) I’m glad na-convert ka na! :) Til next time! 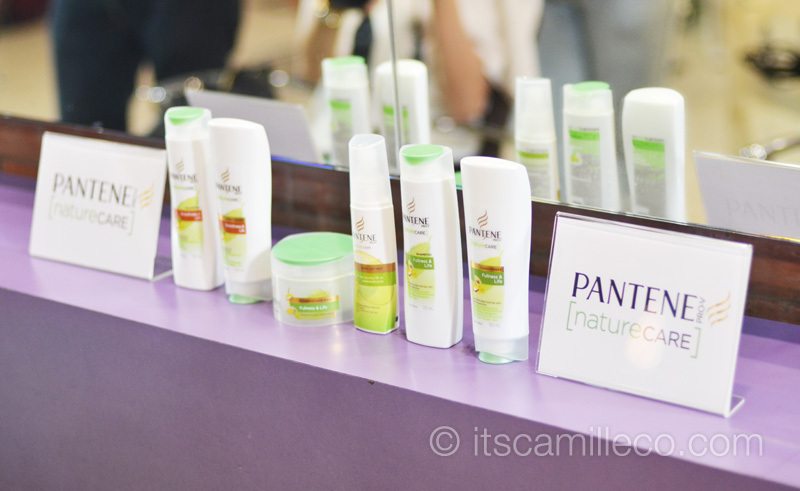 I love Pantene Nature Care too.. It works well with my natural curly hair. White is always beautiful.. It looks good on you. It blends perfectly with you skin tone as well as the accessories, of course. wow! 2 of my favorite bloggers…together? ohsum! teehee.. reading this makes me wanna try the new variant of Pantene. eheheh…and yeah! ur definitely right, with simple clothes paired with the right accessories should still look striking, it all depends on how you carry urself. waahh I love your hair, and your skirt is unique too! you look like an angel in this look! That close up photo of you is sooooo cute!!!! 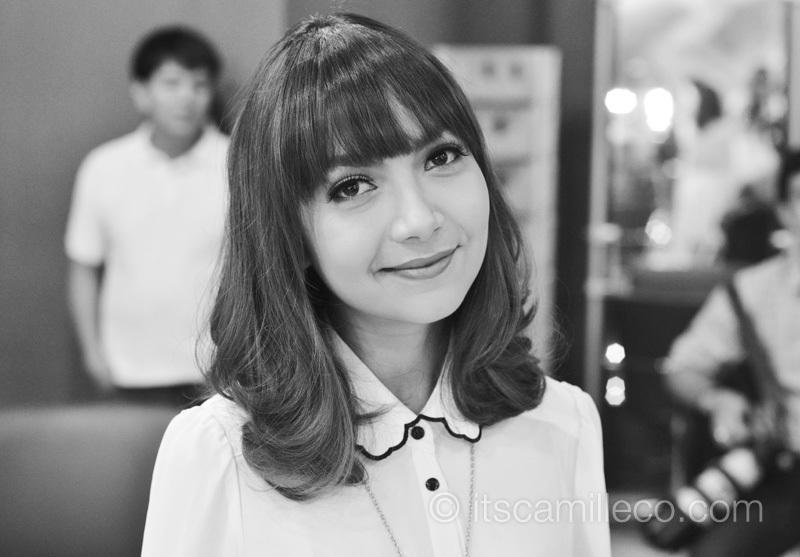 :D Ang kinis mo ate Camille! I love what you’re wearing. I even thought it was a dress! Haha that is random! :) Thanks Ianne! Maganda lang ang lighting! Awwww no I’m not but thanks Kristine! you are so good at balancing your outfit. its simple yet there seems to be nothing missing :PP i love it :D especially your shoes. WOW!!! I thought it was a dress! Amazzzzing! :) Gosh, I’m officially a gold convert! haha. Before I really didn’t like gold accessories coz I thought it didn’t look cool… oh, how stupid I must be! Imma start collecting na! hehehe… Thanks for another awesome post… :) Sooo inspiring talaga! AWww you’re sweet! Thanks AliceJane! When I read “ONE OF A KIND”, only G-Dragon came to mind. Anyway, I’m so glad that you chose Bestie, because I absolutely adore her! She’s so cute and quirky! Hahaha you love k-pop too much! :) I think Bestie is so cute and quirky too! I love getting my hair done! It feels so good! Gorgeous dress & accessories! and ugh, those heels are amazing! Teehee okay! :) I’m trying to do that more often! LOVE especially those heels! Grabe dapat pala your future boyfriend should stand at least 6’3 para lang wag siyang mag mukhang pandak when standing beside you if you are in heels eh! What if your future bf is just as the same height as you are when you’re in flats, would you still wear heels on date nights or whenever you are near him? haha! Well my ex was so I guess I still would. Pwede na 5’10! :) Haha! How gorgeous are your hair???? Mangyayari yan! :) Thanks Jawie! wow!Sway kung sway,bounce kung bounce!haha. your so gorgeous in white!Your accessories stand out! :) I’ll definitely change my shampoo from ______ to PANTENE! I promise that! :)) haha. really gorgeous! i sooo love the shoes!